The first book in the Bad Ideas Book Club, aptly named How to Eat an Airplane, explains: If you want to eat an airplane, there are a few things you should know. The truth is, most airplanes are too large to eat by yourself, so if you want to eat an airplane, you should have a party. It’s fact-based picture book fiction at its most absurd! 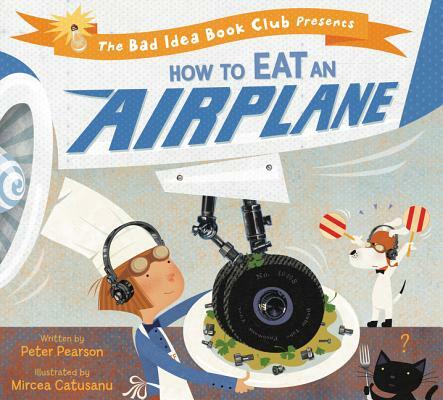 By crossing two unrelated topics—dinner etiquette and jet plane mechanics—How to Eat an Airplane creates an unexpected and absurdly funny experience for young readers. Inspired by the true story of Michel Lotito, who from 1978 to 1980 ate an entire Cessna 150 airplane and holds the Guinness World Record for Strangest Diet, the book covers everything from setting the table with forklifts and toasting with engine oil to fastening your seat belts at the table and taking a nice stretch in between courses—preferably on the airplane’s wings. There’s a disclaimer included for anyone who believes the book is an actual guide—as well as four pages of fascinating and relevant airplane facts. Perfect for precocious readers and airplane lovers as well as teachers and parents looking to enjoy something unique and fun. The Bad Ideas Book Club: Where the best ideas are bad ideas. Peter Pearson spends most of his time pressed against the fence of the Minneapolis–St. Paul International Airport. He was almost kicked out of the children’s writing program at Hamline University for eating a teacher’s pencil, but fortunately they let him stay. Mircea Catusanu spends most of his time suspended at thirty thousand feet between his native Romania and his home in New York, living the high life. Literally. He enjoys fishing off Long Island for one of his favorite sandwich ingredients: submarines.